I love gardening! I love watching the plants grow and even better is when they begin producing vegetables or flowers. Starting seeds indoors is a great way to save money right from the start. Watch the video to join me in my greenhouse as I start my seeds! I normally have a very large garden but then, I have the space for it. Whether or not you have a lot of room or just enough for a few containers, gardening can be very beneficial. A lot of food can be grown if a very small amount of space! In the following vidoe, I am in the greenhouse and you can see that I have already started planting my seeds. Watch the video as I go through the basics of starting seeds indoors. 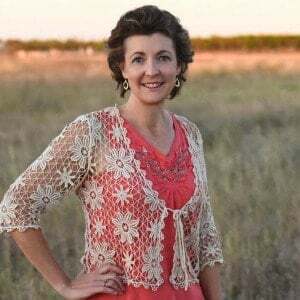 As I mention in the video and in the spirit of keeping it real, you can see that I have started planting and even have some dirt on my face – oops! Oh well, gardening is great way to get dirty while having fun! Here are the items you see me using in the Starting Seeds Indoors video. The links will take you Amazon. Seed Starter Trays – These are the trays that I use but I purchased them at a local nursery and they were less expensive. Seed Starter Soil – This is the type of seed starter soil I use but again, I was able to find it less expensive at a local nursery in a 25 lb bag. 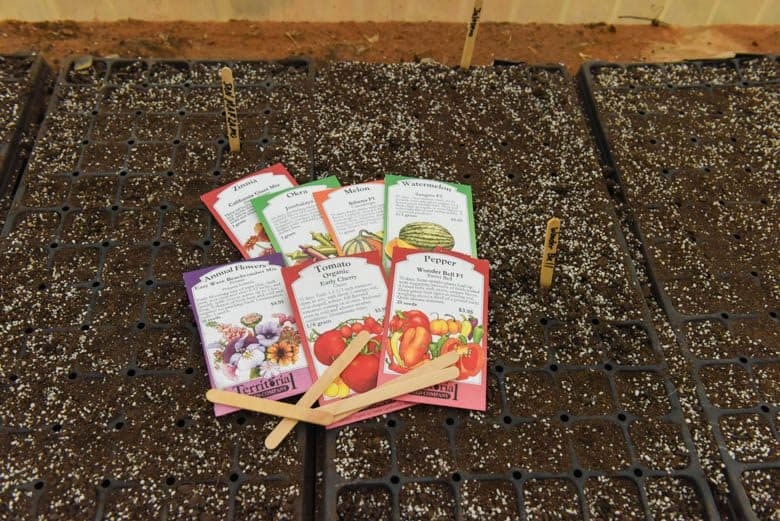 Popsicle Sticks – These work great to mark the seeds when they are planted – write the name in marker on the stick and push it into the soil. Saves Money – Just think about it, no matter how much or how little food you grow, it is food you don’t have to buy. This saves on your grocery bill! Quality Control – You have control over how the food is grown and what (if any) fertilizers, herbicides or pesticides are used. Exercise – Gardening is great exercise. Especially if you choose not to use herbicides, you will be hoeing and believe me, that is good exercise and gets your heart rate up there. Increases Vitamin D levels – Being in the sun allows your body to make vitamin D which, according to some authorities, many people are deficient in. Gardening lets you get your vitamin D naturally without taking a supplement (saves you more money!). Typically the garden vegetables that I start indoors from seeds include tomatoes (San Marzano, Cherry or Grape…), bell peppers, jalepeno peppers, eggplant and this year I am trying petunias. Direct sow means that the seeds are sown directly into the garden soil. While many of these can also be started indoors, it is just as easy to do it in the garden. These included squashes (yellow summer, zucchini, acorn, pumpkin, butternut, spaghetti) cucumbers, beans, peas, okra and melons (watermelon, cantaloupe). I also direct sow zinnias and sunflowers. Seeds – Seeds are available at local hardware stores, Walmart or online. Since I have a large garden, I like to buy in bulk so I purchase my seeds online. I like Territorial Seed because their prices are good and I have a good success rate with their seeds. For specialty tomatoes, I have also used Tomato Growers. Territorial Seed now carries one of my favorite sauce tomatoes, San Marzano so I did not order from Tomato Growers this year. Containers – In the video I show my seed starter flats that I purchased at a local nursery very inexpensively. Egg cartons work great just remember to poke a hole in the bottom for water drainage. 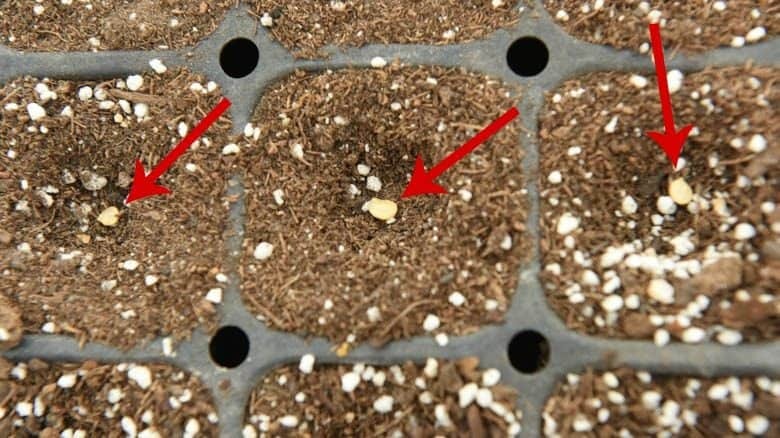 Soil – Sterilized soil is important for starting seeds indoors because of virus contamination. Damp off is a virus that can kill seedlings very quickly and can be prevented with sterilized soil. Purchased potting soil will be sterile so there is no need to worry. If you have an opened bag of soil laying around you can easily sterilize it. Place the soil in baking dish at 200F. Using a thermometer, allow the center to reach 180F and hold it there for 30 minutes. Allow to cool and it is ready to use. Sunshine – Once the seeds are planted, they need plenty of sunshine. I keep mine in our greenhouse. Before we had it, though, I used a window sill that received a lot of sun. Water – Be sure to water your containers keeping them moist. You don’t want to drown them but you also don’t want them to dry out. Gardening and starting seeds indoors does not require a lot of space. Pick a sunny location to place your container in and let them grow. If using a location inside, be sure to have a tray or cookie sheet to set your container in to catch the water that runs out. Believe me, it can make a mess! 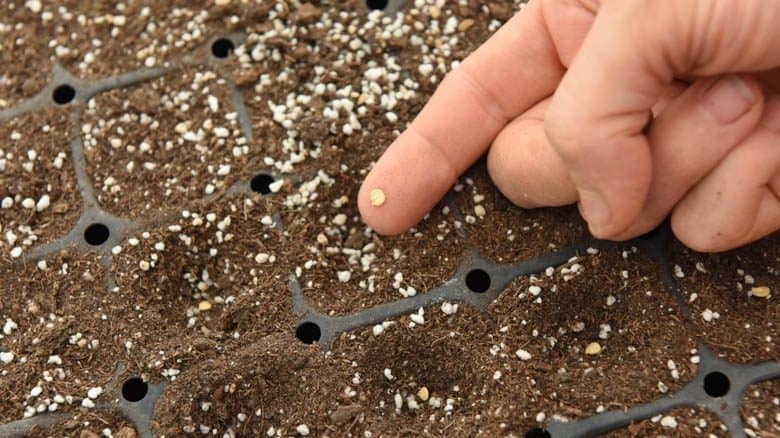 Check the seed packet to find out the germination time – this is the time it takes for the seeds to sprout. It varies depending upon the type of seed. Some are as quick as 3 days while others can take 2 weeks and some flowers (petunias) 30 days. The back of the seed packet gives the necessary information about how deep to plant the seed, as well as, how far apart to plant them. 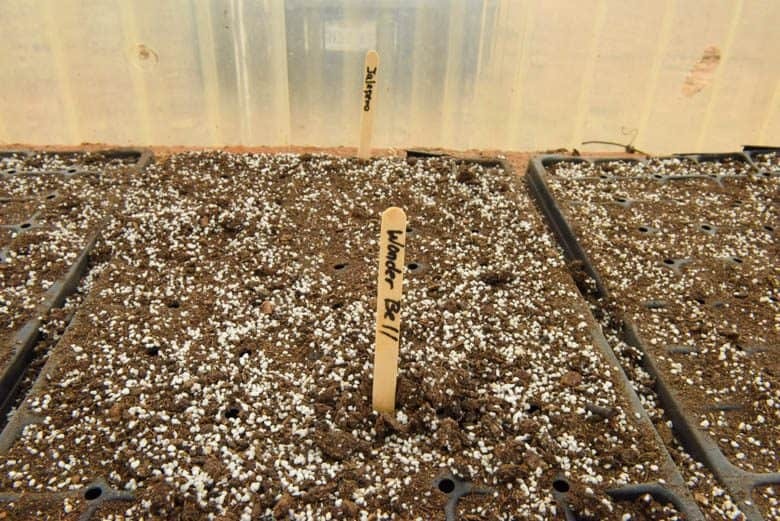 Mark what seeds you have planted – I like to use popsicle sticks marked with the name in a heavy marker. 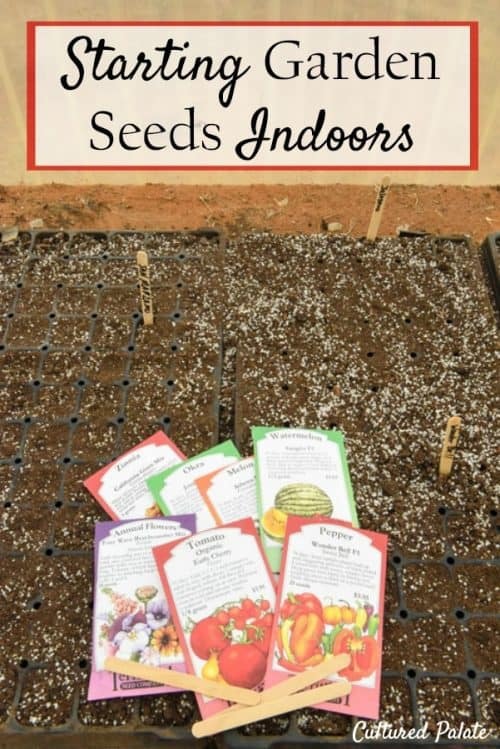 Now that you are ready to start your seeds indoors, what will you be planting? DIY Brick Patio - How to Make Your Own!